Not anymore! Now you can use a natural approach without hurting your wallet! The all-natural ingredients are the reason Nature’s Rite Joint Relief™ is so effective in the support of cartilage and joint health. Devil’s Claw, Celery Seed, and Poke Root. Together, this trinity of ingredients has been used for centuries to support joint health. Frankincense also has been used for thousands of years to promote structural health. Arnica Montana, White Willow Bark, and Feverfew are traditional analgesics, which are great musculoskeletal and joint support. Comfrey and Arnica are traditional herbs known to support Cartilage and joint function. Peppermint contains menthol, which has a cool and soothing effect. 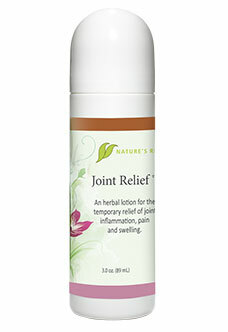 Nature’s Rite Joint Relief™ is a roll-on topical. It is highly effective at supporting your body in creating relief, especially in combination with a supplementation program of Vitamin C, Vitamin D, Copper, Boron, Glucosamine Sulphate, and Chondroitin. Nature’s Rite Joint Relief™ makes sense because it works on multiple fronts, incorporating natural ingredients that have been used for centuries. By taking a holistic approach, Nature’s Rite Joint Relief™ offers sufferers a highly natural option. My name is Steve Frank and I’d like to tell you a little bit about the path that I traveled to develop Joint Relief™ for you. You see, joint pain is very common, but the causes differ widely. I spent some time in Arkansas digging roots, gathering plants and berries and just sittin’ with relatives a few years ago. I listened closely to all the remedies that had been handed down through the ages. While it’s true that I had to drink some moonshine and Poke root, some were a little easier to tolerate. I listened to some of the suggestions from the clans and worked with some additional, traditional herbs. At first, the formulations worked well for some people but not others. So I used three different formulas until I could determine which ingredients provided the most good for the most people. After a couple of years of trial and error, I arrived at what I feel is the best combination of North American herbs. Now, I’m not trying to sell you Menthol in a greasy base like so many other people. I have here in Joint Relief™, a combination of herbs in a water-based lotion that will not sting if it gets into your eyes and soaks into your skin in mere minutes. I always say, “Nothing works for everyone…” but I heartily encourage you to give this a try. It’s not a gimmick and it is not a dangerous prescription. It is simply the best combination of herbs that I can show you. Joint Relief™ is in a convenient roll-on container so you don’t get it all over your hands while you’re applying it where it needs to be. Go-ahead. Give it a try.